creo care review and giveaway. I like staying hotels. No, scratch that…I love staying in hotels. I have no idea why. I suppose it goes hand in hand with my love for travel and exploring new places. Or my love for being waited on and pretending that I have a household staff of 100 people ready and waiting to entertain my every whim. 😀 Still, even I can find a few downsides to hotel living. The biggest has to be toiletries most hotels put in their guest rooms. Maybe it’s just me, but my skin and hair typically don’t like the little bottles of lotion and hair care products hotels give out. My skin becomes extremely dry and flaky, while my hair gets dry, unruly, and generally begins to hate me. I’ve never understood this. The products are made by well-known cosmetics companies, most of which I’ve used on a regular basis, and yet, my hair and skin rebel when they come into contact with the hotel versions of these products. I’ve resorted to bring products from home, which is a pain, as I’d like to reserve the space for something more practical (read: stilettos). Being the kind of blogger who loves trying out new products and sharing with her readers, I asked the company if I could review some of its products. They graciously agreed, and promptly sent me a conditioner, hair cleanser, and hair masque. I used these items in conjunction with one another for six weeks. I don’t often have good experiences with sulfate-free shampoos. It’s been nearly a year since I parted ways with sulfate-based products, and I’ve spent the time since searching for a decent sulfate-free replacement. Most dry my hair out, actually stripping it of its natural oils, but Creo’s Hair Cleanser didn’t do that. I was able to lather up and rinse without a tangle, snag, or patch of post-shampoo roughness. My hair felt smooth and hydrated, in the same way it did when I was still using salon products. This was a first. I had to check the ingredients to make sure there wasn’t a “secret” sulfate lurking in the bottle, as is often the case with other “sulfate-free” shampoos I’ve tried. There wasn’t one. I now have a new favorite shampoo, for traveling, as the 10-oz bottle is compact enough to easily fit in an overstuffed suitcase, but holds more product than travel-sized brands. The conditioner was next. I slathered it on, expecting a result similar to what I’d had with the hair cleanser. Unfortunately, the tangles that I avoided with cleanser arrived with the conditioner’s minty hydration. Combing through was hard, and I had to use another conditioner to get my hair balanced again. I tried it again a few days later, and had the same result. A week after that, I tried it one more time, and didn’t have the tangles I had the previous two times. It hydrated my hair well this time, but my hair also felt sticky and limp. I realized that despite my best efforts, my hair wasn’t going to like this conditioner. I had to stop using it. I don’t think the conditioner is a bad product. I think the fact that I have a head full of dry, curly hair that is also color-treated is the reason I didn’t get good results. I gave the conditioner to a relative, who has had a much different experience so far, which leads me to believe that it is my hair and not the conditioner. It’s a shame, really, as I really wanted to like it. I adore this product. Absolutely adore it. Having color-treated hair, dealing with dryness is a constant theme in my daily routine. I knew I needed something to supplement my deep conditioning treatments, but couldn’t find products that would do the job. 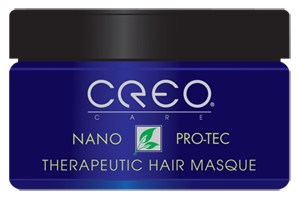 I didn’t expect much from Creo’s Hair Masque, but it surprised me. I kept it on my hair for six minutes the first time I tried, not expecting much from it, and found that it gave my hair a much needed boost in moisture in just six minutes. Most of my deep conditioners require that I leave them on for at least an hour, and don’t deliver the kind of results the Hair Masque did in those six minutes. The next time I used it, I left it on for thirty minutes, and my hair was smoother and more hydrated than the first time. The fact that it doesn’t take much to do the job wasn’t lost on me, as I don’t like putting huge blobs of product on my hair at one time. A little certainly goes a long way with this masque, and my hair is looking much better because of it. To sum it all up, I love the Hair Cleanser and the Hair Masque, and have mixed feelings about the conditioner. I see myself purchasing the other two in the near future. Creo is letting a lucky Wanderlu5t reader try one of their products! To enter, leave me a comment about your worst experience with a drug store or salon hair care product. That’s it! The contest ends at noon on February 11,2011. Good luck! « my travel goals for 2011. I have never had a really bad experience, but I have very fine hair and find that most products weigh my hair down. When getting my hair done in a salon I have to warn them about this, so they will use the appropriate styling products. I have also thrown out many drug store hair products because they are just to heavy for my hair. Still have not found the perfect one. I spent $17 each on a boutique brand shampoo and conditioner for my minimally processed hair. The shampoo was ok but left me with a tangled mess of hair. When I put the conditioner on my palm it dripped off my hand and went right down the drain it was so runny. I then resorted to applying it directly from the bottle to my hair and still found myself tugging and pulling to get the tangles out. Awful. Needless to say, I am still on the lookout for a shampoo and conditioner that is free of all the “junk” but effective. Once, I bought a brand new shampoo and condition. I think it was garnier fructis or treseme when they first came out. My hair was sticky and greasy after the first time I used the product!!! It was so gross!!!! I once tried BIOLAGE which everyone said was fantastic, and it left my normally bouncing curls limp and lifeless. My worst experience was with a conditioner that was the consistancy of a shampoo! It did not take the tangles out of my hair or my children’s hair (as it claimed it would). I bought a huge pump bottle of shampoo from sally’s beauty salon, it smelled great but was the worst shampoo I have ever used in my life. I don’t even know the name but if I saw the bottle I would know to stay away. My hair was a total mess. Haven’t had any really bad experiences with any certain product. Just haven’t found a product yet that helps my dry scalp/dandruff.